Angling really is an art and a good reel can help you perfect it. The right baitcasting reel will help you get precise casting and make it easier to reel in your big catch. 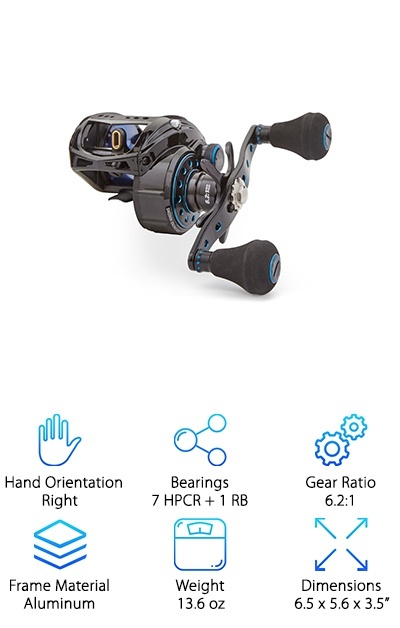 To help you find the best baitcasting reel, we’ve put in our time doing research on the newest and best=-selling baitcasters around. Before we get into our baitcasting reel reviews, here are the important features you need to know when choosing your reel. Hand Orientation - A lot of our picks are for right handers. That’s just because there are more of them out there. Lefties, never fear! If you find something you like, a lot of brands make identical left-handed versions. Bearings - Ball bearings basically keep the best casting reels moving more smoothly. Do you want a reel that can handle heavy fish? Do you fish often and want something that’s going to last a long time? The more ball bearings, the better. Gear Ratio - This is basically how fast the reel spins and it’s given in a ratio. For example, a ratio of 6:1 means that for every 1 turn of the handle, the spool revolves 6 times. Frame Material - Lightweight, durable material is best. That way, you’ll get something that won’t bog you down while being tough enough to last in a fight. You’ll find a little variety here, from aluminum to graphite to composites. Weight - Generally, lighter is better but it really is personal preference. It won’t put a lot of weight on the rod and will make it a little easier to make it through those long, tough days out on the water. Dimensions - Obviously, this is how big the reel is. Again, this is personal preference but keep the size of your rod and your hands in mind. 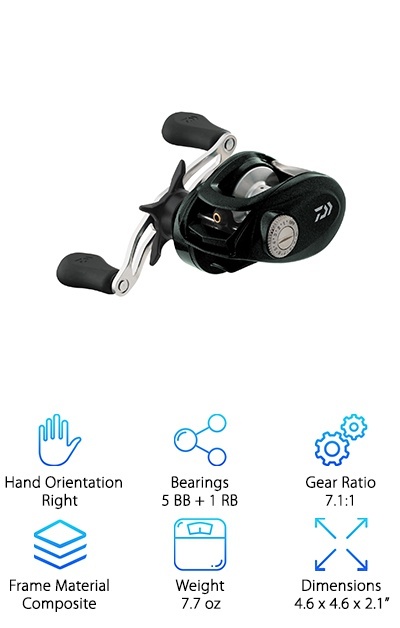 If you have large hands, try a larger reel. Smaller hands? Try a low profile one. Finding the perfect fishing set up doesn’t have to be hard! All you have to do to get the best baitcasting rod and reel combo is find the right baitcaster reel and pop it on your favorite rod. Now that you know what features to look for, let’s move right into our baitcasting reel reviews. If you don’t have a lot of time, make sure to take a look at our top and budgets picks. All right, let’s go fishing! The first thing to mention about our top pick is the bearings. You won’t see HPCR bearings in any other reel that we researched and they’re a big feature of this one. High performance corrosion resistant (HPCR) bearings are an Abu Garcia original. And, no, they’re not treated steel. They’re actually made of rust resistant stainless steel. This is a smooth, strong reel that will last. That’s not all this best baitcaster reel has to offer. 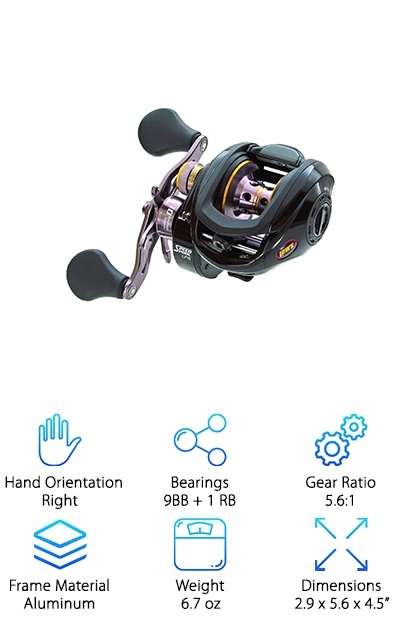 It’s an ideal reel for hard pulling fish, making it the best baitcasting reel for bass. It’s low profile and has 3 different power handles so you have some customization. Plus, it’s made of aircraft grade aluminum, keeping it both lightweight and strong. Our best baitcasting reel for the money is right here. It has a reinforced graphite frame for strength and durability plus 6 stainless steel ball bearings to avoid any snags. The spool is composed of machined aluminum. Not only is it strong, it’s lightweight, too. There’s also a fully adjustable magnetic cast control system that helps your cast go the distance. That’s not all. You can easily fight back against your catch with the multi-stack drag washers. Plus, it has a quick access removable side cover. With a gear ratio that matches some of the much more expensive options, it works just as fast. This best budget baitcaster is an effective and powerful choice that can help you make your next big catch. The Quantum Fishing Accurist has PT bearings. What does that mean? They’re made of a polymer-stainless hybrid to help them last a long time. Not only is the frame made of aluminum, it’s also one piece with an easy-access side cover. This is a pretty rugged reel that will go the distance. Another unique feature is the Flippin’ Switch, an easy way to get instant gear re-engagement that helps with control. For you, that means you’ll be better able to place your lure exactly where you want it to go. The internal ACS and external magnetic cast control systems add to this precision, too. That’s not all. The gear ratio on this one is great, allowing you to reel in your line a little bit faster. Another awesome low-profile reel, the KastKing Royale Baitcasting Reel has a high speed gear ratio. 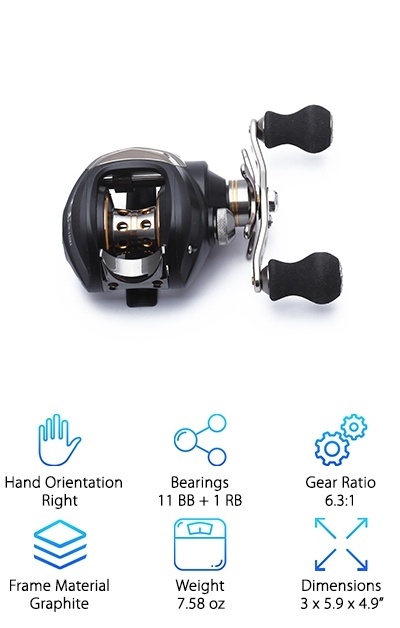 With a total of 12 corrosion resistant ball bearing, you can be sure you’ll get a smooth cast and reeling in your big catch will be a little nicer, too. You might be wondering, what about control? This reel has dual brakes with an easy to adjust centrifugal and magnetic brake system that gives you a lot of it. There’s just so much to love about this reel. It’s super silent, even at high speeds. The drag system is reliable. It has an aluminum spool on a stainless steel shaft so it’s both lightweight and strong. Plus, it just looks cool. And get this. It’s both saltwater and tournament ready. This reel comes with a smaller profile and a lighter design but doesn’t sacrifice performance at all. It includes the brand’s innovative dual-braking system. How does it work? The magnetic brake system uses an external click dial while the internal centrifugal brake system has a 4-pin on/off control. 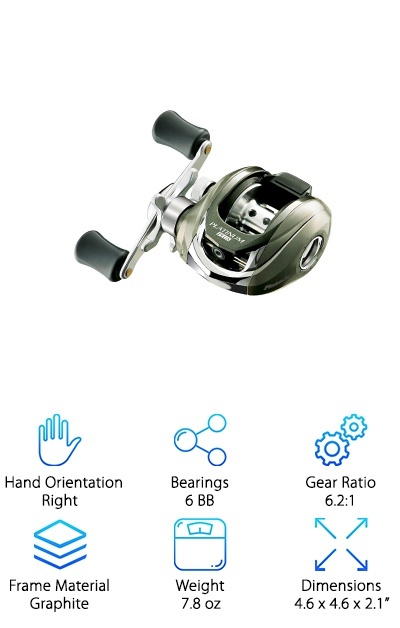 The stainless steel ball bearings and double-shielded for durability, helping this reel last for a long time. The one-piece aluminum frame keeps it light and easy to handle and also adds to how tough this reel is. You get 20 pounds of drag power thanks to the carbon fiber star drag system. That’s not all. It also comes with Lew’s paddle handle knobs and a bowed, lightweight reel handle. The external lube port makes maintenance easy. 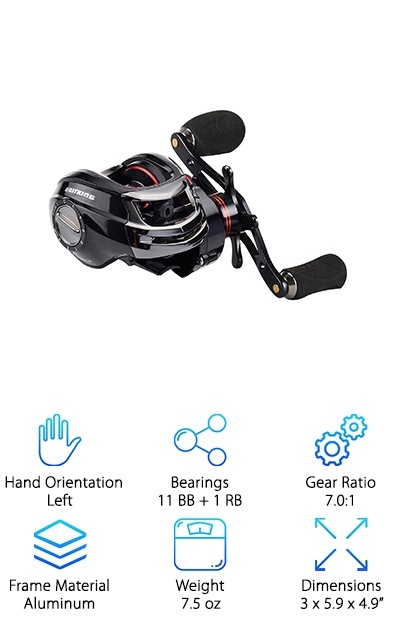 If you’re looking for something that’s user friendly and also one of the best baitcasting reels, check out the Daiwa Laguna. It’s been newly redesigned with a lightweight composite frame and side plate. It’s lightweight, effective, and also really comfortable. Why? Because of the swept handle, unique I-shape, and soft touch handle knobs. It’s also fast thanks to the high gear ratio. As far as casting goes, well, you’ll go far! It’s precise, too. It’s all thanks to Daiwa’s exclusive MagForce Anti-Backlash system that allows the spool to start faster and spin longer which gives you a lot of control. The reel has a cool look, too, because of the open profile. But it’s more than good looking. It also provides superb ergonomics. With 11 + 1 bearings, this is a smooth reel. The magnetic brake system is fully adjustable. What does that mean for you? More control over your cast. This low-profile reel is comfortable to use thanks to the streamlined frame and the extended, bent aluminum handle. That’s not all. There’s large EVA knobs so you know you’re going to be able to get a strong grip. The spool is made of double coated aluminum so it’s lightweight and made to last. The frame is made for longevity, too, because it won’t corrode. 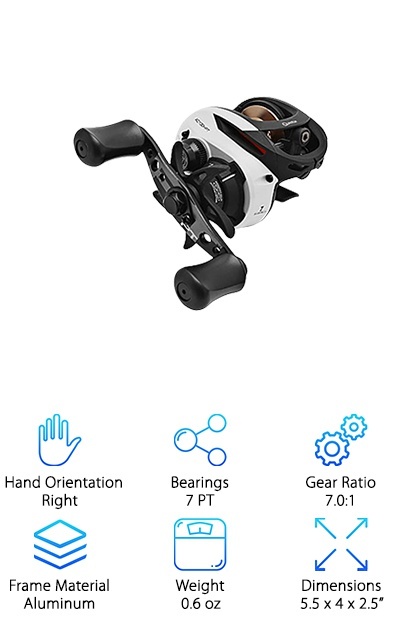 This is another good option if you’re looking for a best baitcasting reel for the money. It’s very reasonably priced and performs as well as much more expensive options. This is a low-profile baitcaster that is great for accuracy. What makes us say that? First of all, the MagTrax brake system allows for long-range, accurate casting. It works by applying constant brake pressure that’s also customizable. It’s also made to last a long time. The 1-piece graphite frame and double-anodized aluminum spool are made for lightweight durability. Not only that, but the gears will last just as long because they’re made with Duragear brass. Some people with large hands might shy away from a low-profile reel but this one is comfortable for anyone to use. The recessed reel foot and compact bent handle make it a great ergonomic choice. One more thing: the Power Drag system helps you tame any hard-pulling fish. With it’s cool modern design, the Shimano 200IPG Cuardo not only looks great, it’s hands down one of the best baitcasting reels around. The offset handle and center clutch design not only add to the funky look but give it a great feel, too. In fact, it’s ergonomic design makes it really comfortable to use. The SVS Infinity Brake System is unique in that it’s a centrifugal system that has an easy to access external control. The spool was redesigned with Shimano’s Stable Spool Design, improving casting by trying to eliminate spool vibration. What does that mean for you? A balanced, stable spool and an accurate, smooth cast. One more thing. The gearing on this is superb, on par with Shimano’s higher end reels. 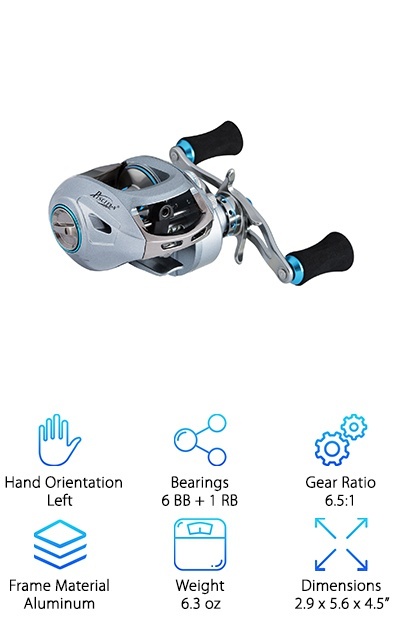 Another option if you’re looking for best baitcasting reel for the money, the Piscifun Saex Baitcasting Reel is a compact, lightweight powerhouse. Thanks to the aluminum alloy frame and machined aluminum spool, this reel is exceptionally durable, too. 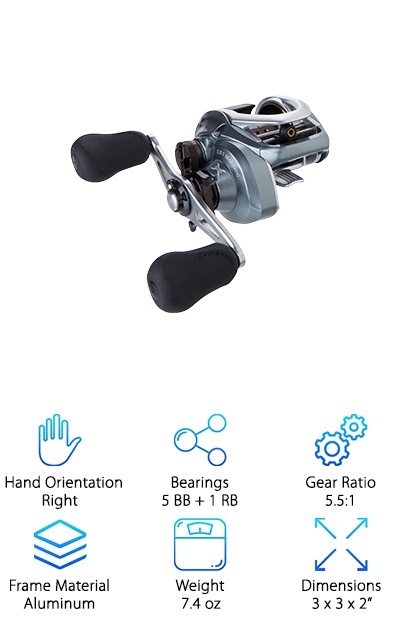 The ball bearings are all double-shielded meaning they’ll help you cast smoothly on years of fishing trips. Thanks to the 270-degree magnetic brake system, you can combat wind with just the touch of a finger. For more power when you’re reeling in your next big catch, take full advantage of the extended swept-back handle. 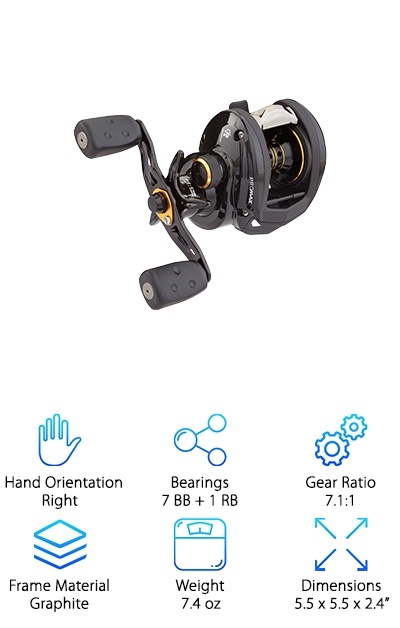 It also has a pretty impressive gear ratio for a reel in this price range. Oh, and here’s the best part: it comes with a 1 year worry-free warranty.